BRT is coming to Pretoria and New Jersey. Above, a BRT station in Johannesburg. Photo by AfricanGoals2010. The states of Delaware, New Jersey and Pennsylvania have been appropriated $1.4 billion for transit investments over the next three years, as part of the Transportation Improvement Plan for Pennsylvania (TIP). Newly added to the TIP’s long-range plan is a bus rapid transit (BRT) corridor to connect southern New Jersey to Pennsylvania. 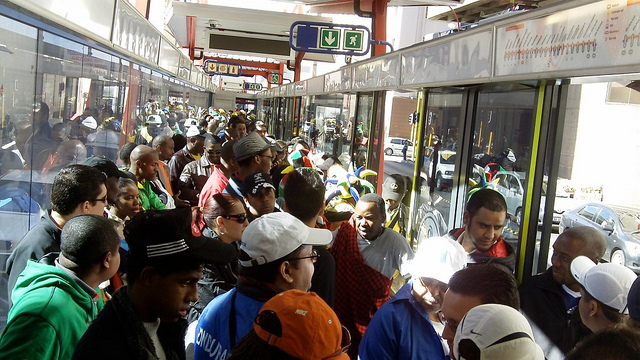 The City of Tshwane in Northern Gauteng Province, South Africa initiated construction of a R2.6 billion (US$314 million), 80-kilometer (49-mile) bus rapid transit (BRT) system that is scheduled to start operating from Pretoria’s central business district to northern suburbs by April 2014. The fate of a planned bus rapid transit (BRT) line spanning the Tappan Zee Bridge in upstate New York became more tenuous as a report over project costs for the bridge’s revitalization cast doubt on the $5 billion project. Previous reports indicated the cost might be much lower. Delhi’s bus rapid transit (BRT) system may be effectively dismantled if India’s Supreme Court orders that dedicated rights of way for buses are opened to mixed-flow traffic. State officials would appeal the case if it reached the nation’s highest court. The State Senate of California voted to approve the first segment of a $68 high-speed rail corridor that will eventually connect 220 mile-per-hour trains from San Francisco to Los Angeles. The East Coast and Midwest suffered massive heat waves this past weekend, highlighting an increasing trend of record-breaking temperatures linked to the effects of global warming. Alhaji Collins Dauda, the minister of transport for Ghana, called for nationwide action to decrease traffic induced mortality, 60 percent of which is caused by speeding. Guelph, a suburb of Toronto, launched a campaign rewarding drivers and cyclists for driving safely, offering restaurant and tire-shop gift certificates to risk-averse drivers throughout the summer. The California Transportation Foundation awarded the billion-dollar Interstate-15 high-occupancy toll (HOT) lanes project, “Project of The Year.” These southern California highway lanes use an automated toll interface that incrementally charges users based on traffic intensity, costing up to $8 one way for lane use during peak traffic. Signage and advertising campaigns in London subtly suggest that city residents find alternate plans during the 2012 Olympics, set to take place in 14 days. To demonstrate the crush of visitors expected for the worldwide sporting event, Transport For London simulated the impending transit traffic by closing Underground exits and refusing passengers after peak loads during Tuesday’s morning commute. The New York Metropolitan Transportation Authority (MTA) announced a pilot smartphone-based ticketing on Metro-North Railroad trains. Passengers will be able to buy their tickets on their phone and have fare collectors scan their screens. If this pilot proves successful, it could effectively eliminate paper ticketing.